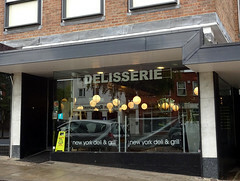 New York deli in Stanmore, part of a small chain comprising half a dozen locations spread around North-West London. This one occupies a long, narrow space, seating around 50 at a combination of booths, banquettes, and free-standing padded upright chairs. The style is art deco, with clean lines, Tamara de Lempicka prints on the walls, and a fan-shaped mirror at the far end. Kake visited on a Monday morning in September 2017. I was the only customer when I arrived around 9:45am, though three more turned up just before I left. Retro music was playing, quite an interesting selection and not too loud. I went for shakshuka with pitta (£9) photo, which comes with a choice of cheeses; I chose feta. The tomato sauce included slightly undercooked aubergines, though the peppers and onions were fine, as was the sauce itself. The eggs had been treated somewhat strangely; there was a weird skin on top of them that suggested they'd been heated from above long enough to cook their top layer, rather than the heat coming from below as would be more usual for this dish. Underneath the cooked top layer, though, the yolks were nicely runny. There wasn't quite enough pitta for the amount of shakshuka. Service was fairly prompt. A 10% service charge was added to the bill. Child-friendliness: They have at least four highchairs, with straps but without trays. There's a pull-down nappy change table in the accessible toilet. Their children's menu photo as of Sep 2017 is relatively large and interesting. Accessibility: A short but somewhat steep ramp to get in, with a heavy door to pull towards yourself at the top. Once you're in, most of the seating is on the level. There are no steps to the toilet, but the way there is fairly narrow access and involves two heavy doors; also, on our visit there was a patch of grease on the floor along the way (next to the kitchen access point) that made it dangerously slippery. The ladies' toilet doubles as an accessible cubicle. Last visited by Kake, September 2017. Page last edited 2017-09-05 06:54:17 (version 1).